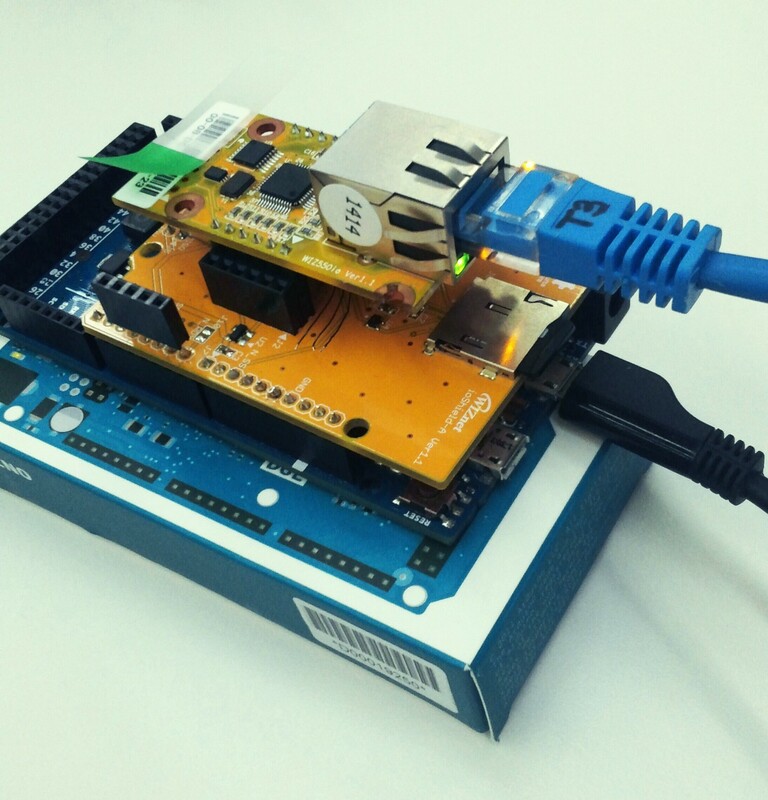 준비물을 이용하여 Arduino Due + Ethernet Shield가 Ethernet과 SD Lib.를 기반으로 FTPPassiveClient로 구동하여, 보드에서 PC쪽의 FTP Server에 접속한뒤 미리 지정한 파일을 다운받는 예제이다. 두번째 방법은 Sketch의 Network의 설정을 보고 windows인 경우는 Local area connection-> Properties ->Internet Protocol -> Properties에서 첫번째 예시에서 든 주소를 사용하여 각각 IP/Subnet/gateway를 설정하면된다. -36Line : char fileName = “test.txt”; //Server쪽에 test.txt를 반드시 준비!! 이제 준비는 다 끝났으니 컴파일 후 sketch를 board로 다운로드 후 FTP Server의 계정과 password를 이용하여 login한후 test.txt를 보드의 Micro-SD 카드에 다운받게 됨을 확인 했다. 그리고 마지막에 받은 파일을 SD카드에서 읽어 시리얼포트로 출력까지 해준다. Tip1. WIZ550io와 Micro-SD의 Data line은 Serial Peripheral Interface Bus(SPI)를 함께 사용하며 Chip Select(CS)신호로 WIZ550io와 Micro-SD를 구별하게 된다. WIZ550io는 GPIO인 D10을 Micro-SD는 D4를 각각 CS로 사용하고 있다. 기존 코드에 CS의 충돌을 막기 위해 Micro-SD의 Init전에 D10을 GPIO를 Output high로 설정하고 이후 WIZ550io의 Init을 실시하였으나, 이번 적용한 sketch에서는 WIZ55oio를 먼저 Init한뒤 SD를 Init하도록 변경하여 CS의 충돌을 피하도록 수정하였다.